Single Nucleotide Polymorphisms or SNPs are a single nucleotide change in an area of an organism’s DNA that is different in more than 1% of the population. SNPs occur in the DNA in 1 out of every 300 nucleotides. In the human genome, this means that there are at least 1 million SNPs in the human’s 3 million-nucleotide genome. Scientists are just now beginning to have the computing power and technology to begin understanding what these changes in the genome do. Scientists are just now beginning to have the computing power and technology to begin understanding what these changes in the genome do. 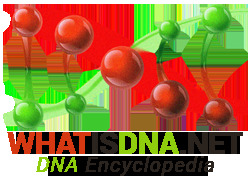 DNA is the basic building block of an organism. In a complex process, the DNA nucleotide sequence that is present in the nucleus of a cell is translated into amino acids. For every three nucleotides of DNA, an amino acid is coded. Amino acids make up the building blocks of the proteins that are used within the body. Each amino acid has its code, and this code gives a protein its particular shape. The shape of that protein dictates its usefulness within the body. If a nucleotide is changed within the DNA, there are four possible options. The first option is that the nucleotide change will do nothing, because that nucleotide is not present in the DNA meant for protein. Second, that change of nucleotide could have no affect on the amino acid coded by the DNA, therefore leaving the protein fully functional. Next, the change of nucleotide could alter the amino acid of protein, but not completely destroy its functionality within the body. Finally, the nucleotide change could alter the amino acid sequence, therefore making the protein unusable in the body. The last option is termed a mutation, and mutations of the DNA cause many diseases. SNPs are not associated with mutations that cause a malfunctioning protein. This type of SNP mutation would be too common and would mean that those people carrying those SNPs or mutations would have a lower ability to reproduce, leading to less of those genetics being found within the population. 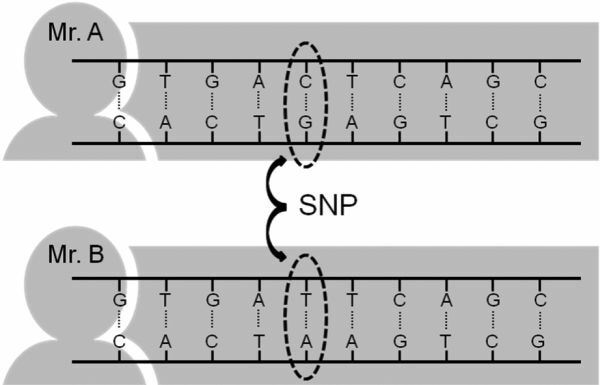 There are two different kinds of SNPs found in the human genome. Linked SNPs are SNPs found in noncoding portions of the DNA. They do not change protein function but they can have influences. Some linked SNPs are related to how people respond to particular medications or can be linked to an increased risk for specific diseases. Causative SNPs are SNPs that are directly related to protein function. Coding SNPs are located within the protein-coding region of the DNA. These SNPs are responsible for protein malfunction and certain protein specific diseases. Noncoding SNPs are found within the regulatory sequences of the DNA, and this can cause the proteins regulated by that sequence to be produced at the wrong time, in the wrong amount, or at the wrong location in the body. 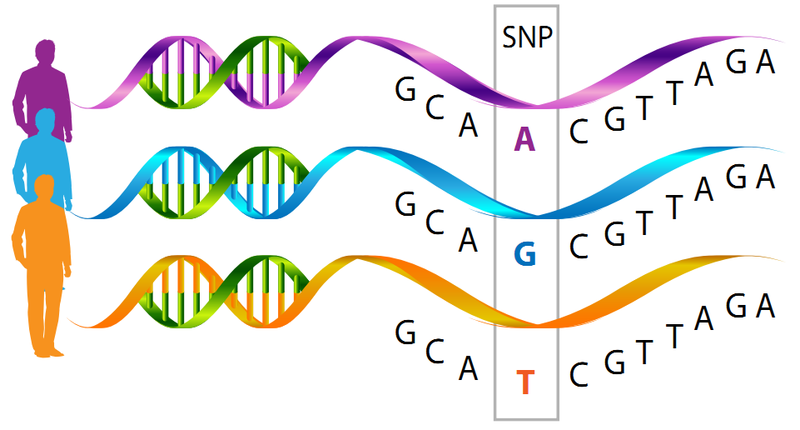 Various types of SNPs are found at different concentrations within the human population. Since humans can have up to 1 million different SNPs, and there are four possible variations on what could be substituted in for the correct nucleotide, there are a vast number of combinations that people can have. Since looking at the entire genome of multiple people at one time is both time consuming and expensive, scientists tend to focus on specific regions of DNA. They identify the SNPs within that region amongst a group or cohort of people. Each person’s individual sequence is called their haplotype pair. Each person has a pair, or two haplotypes, because one is inherited from the mother and the other in inherited from the father. These haplotypes can be different or the same, and often have varied effects on the progeny. Some possible haplotypes do not occur within the population of study, or in the population at all. This can narrow down the specific SNPs that scientists are looking for. 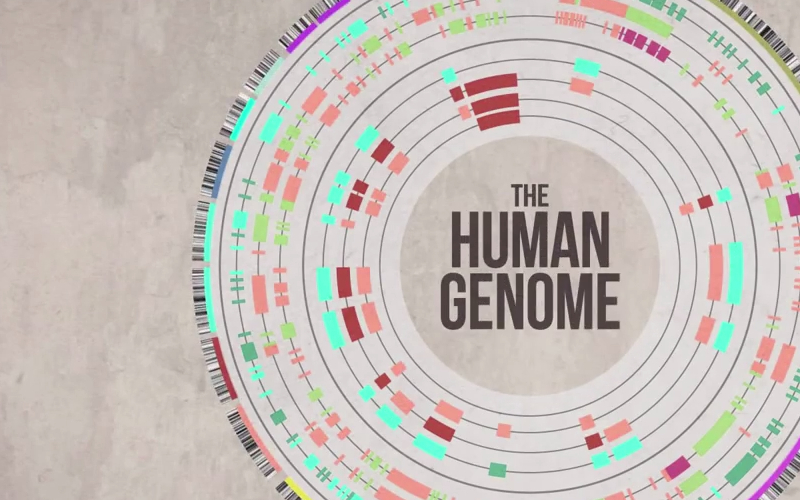 The human genome project was completed in 2003. In 2005 the International HapMap project was begun. The HapMap project is a database of human genotypes from various countries around the world. Each project is utilizing a genome wide association study and entering their data into the HapMap database. A genome-wide association study(GWAS) is where a group of individuals, usually with a specific disease, donate DNA to a genetic array that scans for genetic variants along the entire genome. By utilizing people with the same disease, researchers have been able to find specific SNPs that are related to certain diseases. Common complex diseases such as cardiovascular disease, type II diabetes, asthma, and certain types of cancers have benefitted heavily from the data provided by GWAS. By utilizing people with the same disease, researchers have been able to find specific SNPs that are related to certain diseases. Common complex diseases such as cardiovascular disease, type II diabetes, asthma, and certain types of cancers have benefitted heavily from the data provided by GWAS. Doctors use external indicators such as BMI, cholesterol, or blood pressure to identify people at risk for specific diseases. Often times the disease is caught only after it has reached a critical level that requires reactionary action. Many doctors and patients are pushing for more preventative measures that would allow for identification of risk and action long before the disease has made an appearance. Genome-wide association studies may be the key to making this happen. GWAS have provided a large amount of data about SNPs that are related to complex diseases. Complex diseases, such as asthma, cardiovascular disease, type II diabetes, and cancer have both genetic and environmental components. Most medicine has focused on environmental components and external indicators because there was not enough information on genetic components across large numbers of people. Now, there is a database that can be utilized to look at the genetic profiles of people with a particular disease and to notice common variants of SNPs that are related to that disease. Now, there is a database that can be utilized to look at the genetic profiles of people with a particular disease and to notice common variants of SNPs that are related to that disease. Many hope that by being able to identify common SNPs for diseases, individuals at risk, either through parental lineage or environmental exposure, could take action to prevent the onset of disease. Currently, the cost and time of individual genome assessment still prevents many from utilizing its power. There is hope with the advancement of computer technology that this problem will become smaller and smaller as the availability of these assessments increase. Genome-wide association studies have a lot of power, both in the amount of data they generate and how valid that data is statistically. GWAS have found numerous SNPs that are relevant for many diseases, and have lead to some big discoveries that help doctors to solve the problem of complex diseases. By using a GWAS to study these cohorts, geneticists have found many links to SNPs that do not cause full on disease. The comparison of a cohort with intermediate SNPs with a cohort with full disease SNPs can show which SNPs are most important for specific symptoms of a disease. GWAS are leading the field in identifying and reclassifying SNPs for intermediate phenotypes. Unfortunately, GWAS also have significant drawbacks, generally associated with the wide differentiation between how they are conducted. There are a large amount of studies being conducted, each looking at a difference disease, and often different SNPs related to that disease. This makes it difficult, and statistically insignificant, to compare many of the studies. This is important information in the scientific community, who uses statistics to define whether a given SNP, drug, or other treatment is having an actual statistically significant response in the body. Will it work on other people with the same problems? Is it reproducible? It is also important to note, that each study also uses a different method of statistical analysis, which can lead to even more confusion about the relevancy and interconnectedness of separate research studies. A really good statistician can use the numbers in many different ways and come up with different answers each time. This is confusing for the public, and hinders the use of GWAS by doctors, as there is no common ground to make a decision upon. Single nucleotide polymorphisms are found at high concentrations within the human genome. They can have varying degrees of effect, depending upon where they are located. Each person has a specific haplotype or combination of SNPs present within their DNA, which is specific to that individual. These different haplotypes are studied using genome-wide association studies that compare SNPs across cohorts of people sharing a similar phenotype. The phenotype is usually a complex disease such as cancer, cardiovascular disease, or type II diabetes. By comparing SNPs across people with the same disease certain SNPs have been identified that are linked to each disease. Some of them directly affect the disease, while others have more of a relationship to how the body reacts to treatments or preventative measures. Moving forward genome-wide association studies will hopefully lead to more individualized medicine, leading to more preventative than reactionary treatment to complex diseases. Ancestry DNA «» What Are Dominant and Recessive Alleles?